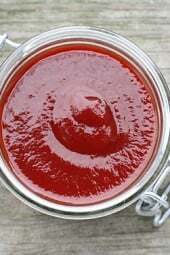 Mm mm, nothing is better than homemade ketchup; making your own ketchup is so EASY to make at home and making it yourself allows you to control what goes in it. Paired perfectly with my Grilled Potatoes. Also try homemade Spicy Chipotle Ketchup. Ketchup is as American as apple pie, that sweet-sour combination on french fries are irresistible and who doesn’t love it on their burgers! But have you ever checked the label of your favorite brand of ketchup? High Fructose Corn Syrup is used to sweeten most brands of ketchup although I did find organic Heinz ketchup in my health food store that does not contain HFCS’s, but it was half the size at a higher price. Wow! This recipe came out great. I have two little kids and wanted to make a ketchup without high fructose corn syrup, and to use in our homemade BBQ and sloppy joe sauces. How long does this last in the refrigerator? Thanks! Why not just buy organic ketchup, relish, mustard, pickles, etc…..they are no more expensive than conventional…Trader Joe's organics are super cheap and will last awhile and you don't have to make it…. @Candice – "he adult digestive system will kill the bacteria in the honey before it reaches the fetus, and therefore is safe. It is dangerous for infants under age 1, because their digestive systems aren't acidic enough to kills the spores and it can cause botulism." Why would I use honey then, Stevia or Agave is better, who wants botulism? Stevia goes through 40 steps to process this from the plant relying on chemicals like acetone, menthanol, ethanol, acetonitrile and isopropanol. some of those are carcinogens. How can a chemically derived extract be deemed safe?? My son goes through SO much ketchup, he puts it on almost everything. I was buying Non-HFCS Ketchups and they were running me $2.44+ per bottle, the cost was really adding up so I am SO happy I finally found you!! I always make the batch double so I don't have to make it as often and I store it in Mason Jars. The only thing I switched was I used Stevia in place of sugar and I used Sea Salt for the Salt but it is still delicious! I make mine with splenda. Sorry I hate stevia. I also add some braggs vinegar, and cinnamon, curry powder, soy sauce and a tiny bit of cyanne pepper. Yum for me. I made a great cocktail sauce for shrimp using 2 tablespoons of lemon juice, 2 tablespoons of horseradish, and a cup of ketchup. Excellent! It got great reviews and I had no leftovers. Thanks for this ketchup recipe. The contents in this homemade ketchup is going to be way better than buying it processed. As for the pros and cons for agave and honey take the info with a grain of salt. I am so looking forward to making this. Thank you. I was so excited about this that I even featured it on my own blog as one of my "Friday Features". Great recipe, Gina! Never will I buy store bought ketchup again! What is the recipe for those chips? They look like the perfect dippers for this Ketchup. Could you reduce the amount of honey/sweetener? I tend to like my ketchup with a "tang" (less on the sweet side) but don't want to compromise consistency. Of course! The consistency really comes from the paste, I think. I'll have to try this because I'm so tired of no longer being able to buy Heinz in glass bottles. Everything is in plastic (and usually unrecyclable plastic at that)! I will elect for honey myself. That said, there may be healthier alternatives, but in the end it's all sweetener. Just sayin'. 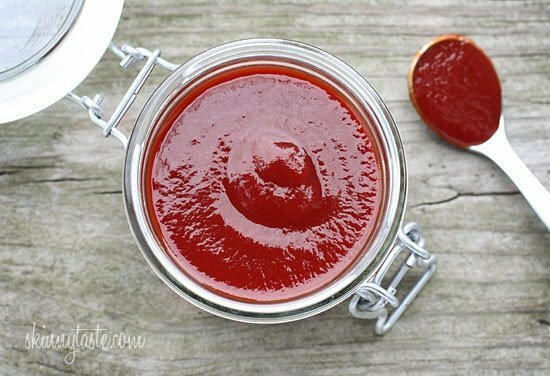 Hands down the best homemade ketchup recipe! I multiply everything x4 and make a big batch. It's also a good base for homemade BBQ sauce when it calls for ketchup. I was curious what the simmering does for it and what to look for to know it is done besides 20 minutes passing. Thanks! It's to get the flavors working together, and cook the raw ingredients (like honey). It also intensifies the flavors. (Sorta like asking why cook anything?) You don't wanna boil it of course, just enough to work out any raw dangers in it. Could you please tell us how long it lasts in the fridge please? And thank you very much for the delicious recipe. Thanks for this great recipe, Gina! I made it the other day, and even the boyfriend thinks it tastes great! In the summer, I buy a lot of local organic honey in my area. I end up spending a pretty penny, but I know it's healthier and I can use it year-round when winter settles in. I love the idea of only a few ingredients in a homemade ketchup and replacing a condiment that is usually ridden with corn syrup and other unnamable things! Thank you again! Hunt's doesn't contain HFCS. That's a major brand so it's not difficult to find. It's very affordable as well. It contains it now. They recently changed their recipe. So disappointed. Does anyone know how long this will last in the refrigerator and is it okay to store in one of the plastic ketchup bottles? I haven't done canning before but could I with this recipe? I made this yesterday and it was delicious! I made a veggie burger wrapped in lettuce with some of this homemade ketchup on it and I loved it! I was just wondering if I could try to can it? I found you via pinterest…thank you for the recipe. We made it tonight as we are running low on our current stach of HFCS free ketchup and I had all the ingredients for this on hand. It is just a bit sweet for but otherwise perfect. Next time I'll omit the sugar alltogether and put a little less honey but the flavor is spot on. My girl loves it. I don't think I'll be buying ketchup anymore. Thank you for sharing the recipe you took so much time to develop. As an editor, I would like to share my expertise with you. In the first sentence of the second paragraph, it should read "that sweet-sour combination ….. is…" as combination is a single subject and takes a singular verb. Now, off to make some homemade catsup, finally. Thanks again! Just by reading the comments, you can tell everyone's tastes vary greatly. If it's too acidic, cut back a bit on the vinegar. If it's too sweet, cut back on the sugar! 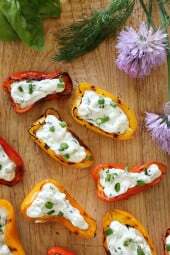 This is a very low-cost recipe, and once you get it just right for your tastes you'll be saving money in the long run. I can't wait to try this! Is it possible to freeze the Ketchup made for later use? Its just my husband and I and I know we may not go through it all in a few weeks, and I don't want to waste. Thanks! Ok, so I am obsessed with ketchup. I put it on almost everything and I ONLY like Heinz (I think Hunt's tastes weird). I've also tried the reduced sugar kind, and other varieties but I don't like any of them. Only the original Heinz recipe. So to those Ketchup lovers who have already tried this, does this take like Heinz at all? I'd rather not make it if I'm going to be disappointed. I'm sure it is great – because all of Gina's recipes are great – but if it doesn't taste like Heinz, then it won't be for me. Please let me know! Everyone's tastes are different. The best way to tell is to try for yourself. All the ingredients are low-cost, so you won't lose out on much if you decide it's not what you are looking for. If anything – give it to a friend or neighbor with the recipe attached. just made this and it was kid approved! 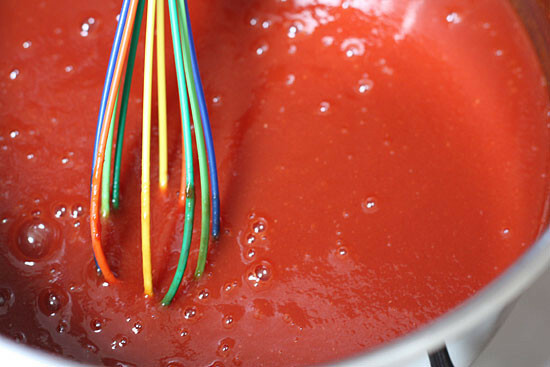 I tried many different recipes for ketchup, but this one is the keeper! Just made this ketchup and it was awesome! This is so easy and way more cost effective than store bought, and I have peace of mind knowing exactly whats in this. WOW Gina, I just found your blog when I was looking for a homemade ketchup recipe, which, by the way is delicious. You have such a breadth of tasty looking AND healthy recipes and I can't wait to try them! Looking forward to trying this recipe! HFCS in ketchup just makes me insane! I've also linked to your recipe in my new blog post: http://www.noordinaryhomestead.com/11-sauces-condiments-you-can-make-at-home/ Hope you stop by some time when you get a chance! Anyone else find the 1/2 cup of vinegar a bit much? Yeah, a little. I added more tomato paste and seasonings to get it to a more tomato-y flavour; the vinegar kinda obliterated it as written. Thanks for this recipe. I'm going to try it when ours runs out. Off subject- where did you find that colorful whisk? Ive been looking for a good home made ketchup recipie! Im excited to try this one out. Great recipe and gorgeous pics. this was great! I can't believe how easy it is. I am going to whip up another batch and use cayenne pepper and garlic powder to make it a bit spicy…Maybe some red pepper flakes.. I found I didn't have to use teh sweetner when using the agave it was sweet enough for my taste! I found this recipe to be way too sweet for me. The flavor was great, but I think I'll halve the amount of sweeteners the next time I make it. 🙂 Thank you for the recipe. Made this tonight for my "indoor cookout." It was just as amazing as all your recipes are. I've lost 25 lbs in the past 3 months thanks to working out & changing my eating habits. I've included many of your recipes. Thanks so much Gina!! Is there a way to make it without vinegar?? I've also been looking for homemade mustard without vinegar. Any suggestions? Perhaps another acid such as lemon? But it will alter the flavor. Look up lacto-fermented ketchup. I believe you make that without vinegar, using whey instead. It takes longer to make, though. I tried this tonight but read the recipe wrong so I used a can of tomato sauce. I couldn't figure out why it wasn't thickening up! Haha, I'm going to have to try it again! This is great, Gina!! Do you have a recipe for chocolate syrup? We love it, but I rarely buy it because of the HFCS. Nesquik syrup has no HFCS, I switched to it from Hershey's several years ago for that very reason. I have also made chocolate syrup myself. I would definitely be interested to see Gina do her magic on a make at home version. hmm does it end up being cheaper than organic store bought? LOVE your site!!! I am out of tomato paste. Could I successfully sub tomoato sauce? Maybe omit the water? Any suggestions to make this work? Thanks! I tried it w/ 1/2 15oz can of tomato sauce and omitted the water. Delicious! I am sure it would be better w/ tomato paste, but worked well. Yes, I would stick with tomato paste for sure. Any idea how long this would keep in the refrigerator? Looks easy enough to try and no preservatives. I'm sure this recipe is great but if you're looking for a good ketchup without HFCS, Trader Joe's is the way to go. Their organic ketchup has only 6 ingredients in it and is only $1.99 for a 24 oz bottle. Also comes in at 1 pp+ for 1/4 cup. I can't wait to try this recipe! I hate how almost all ketchup has freaking HFC in it. Gross! You are making me long for my Mama's ketchup that she made from our garden tomatoes back in the 1950s. Her recipe included a touch of cinnamon! I don't know where that cinnamon came from but it is delicious. Test in a small amount sometime. You might like it! Keep the good recipes coming! Thanks! I just saw a cooking segment that said Heinz will be marketing a new ketchup made with Balsamic vinegar. I think I will try this here. Are you going to do your own BBQ sauce too? I've been wanting to try that and get better tasting stuff without all the extra junk in the store bought versions. Is there a recipe for those thick cut french fries I see in the picture?!?! I could just gobble those up! Thank you for the wonderful recipes! Love them! I appreciate the fact that you are using honey or agave as sweetener…. but I'm curious why you feel it's necessary to put in ANY white sugar at all. I realize it's only 1 tsp…. but is there something that sugar does to the texture or something that you wouldn't get otherwise? I've always wondered about the chemical reaction of sugar in foods. Just wondering if you could substitute a tsp of stevia instead. I'd love to know why you chose sugar. Thanks! The sugar I used was raw, but I didn't specify because that's just the sugar I use in my coffee. You can certainly use stevia instead. Great recipe, can't wait to try it! And I'm going to price it out so I see how much money I save as well. Has anyone tried making this in big batches and freezing it? Perhaps? But not sure how it would taste. Maybe you can cut it back and a bit and add stevia to balance. Love the idea of knowing exactly what is in my ketchup! Perfect time for all of the bbq's and picnics that are going on! That's not a bad price! I payed over $3.50! I've always been a Heinz girl, not sure why. We never have ketchup in our house because we so rarely eat it. I think I could make a much smaller batch of this if we are ever in need because those are ingredients we always have on hand. Thanks! 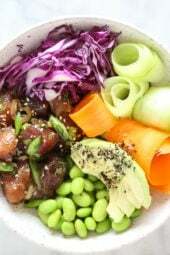 Wonder how to make without using any canned items – no matter what it is, a canned item comes with it's chemicals, preservatives, and all things unnatural. Home grown tomatoes on the vine; must be some way to transform them into ketchup. thanks!! that was my question!!! we have tons of garden fresh tomatoes and we don't use and canned tomatoe products!! This. Is. FABULOUS! Perfect post for summer – thank youuuuuu! Awesome! Some flavored ketchups would be great too. I've been really really happy with the reduced sugar hienz though 😉 no HFCS's. And I see they also have a "simply Heinz" that contains no HFCS either. (boy they make a lot of different ketchups! Lol who knew! How about using a sweetener like Xylitol? Will that work? I'm not sure if it will change the thickness, but I think it would still work. I might try subbing some of the Vinegar for Malt Vinegar. It sounds like it would be fun to make your own ketchup! And just think of all of the different flavours you could make! Right?? You totally get me Kevin! I was wondering about canning the ketchup also. I would also like to know how long it will stay good in the refrigerator. THANKS! I don't know much about canning, but I'm guessing you can. Now can you tackle relish? It is loaded with HFCS! Will make this over the wsekend! Cascadian farms has no HFCs in the relish. I was just thinking the same thing. It's nearly impossible to find ketchup without HFCS and organic is so pricey. I like my ketchup on the vinegar/sour side so I might add a little more vinegar and a little less water. Luckily you can totally adapt this to your taste. You know, I just looked at the ketchup we have this morning and realized it was the Hunt's brand 100% Natural with no HFCS (though it isn't organic). I actually bought it on sale so it was cheaper than all the other brands. But even when its not on sale, its not super expensive like the organic ones. Might be a good alternative for some, though I definitely want to make my own. Especially, like you said, to customize the flavor! I'm so excited to try this! I have bought that kind for a while now because it was HFCS-free. BEWARE! The last time I picked it up it was no longer HFCS-free and says preservative free. Sure enough, read the label and HFCS is in there 🙁 Grr. Thumbs down Hunt's! This just happened to me, too! I've been buying Hunts with no HFCS and I went to grab another bottle and sure enough, it has it now. 🙁 Boo…making own today. AWESOME!!! I need to try this….my kids eat ketchup like it is going out of style, and making it for them would be such a great thing! I wonder if you can use agave instead of the honey? she has that in the ingredients. Agave is really terrible for you! It's actually worse than HFCS. See this post: http://www.foodrenegade.com/agave-nectar-good-or-bad/. It's frustrating how the agave makers managed to market it to people to think that it's healthy! Awesome! I have a love for ketchup, but a hatred for all of the added sugars. I will definately be trying out this recipe! Oh wow! That recipe seems awesome! I think I'm gonna try this during my summer holiday!! I use the recipe from the Deceptively Delicious cookbook for ketchup. It uses carrot puree as a sweetener. You can Google deceptively delicious ketchup recipe to find it, if you don't have the book. This is great! I love knowing what's actually in the food/condiments, ect that I put into my body. It's also a plus that this can be made on the stove, since it's been 80+ degrees here almost every day! Definitely looking forward to that fry recipe, considering how bad fries really are for you. 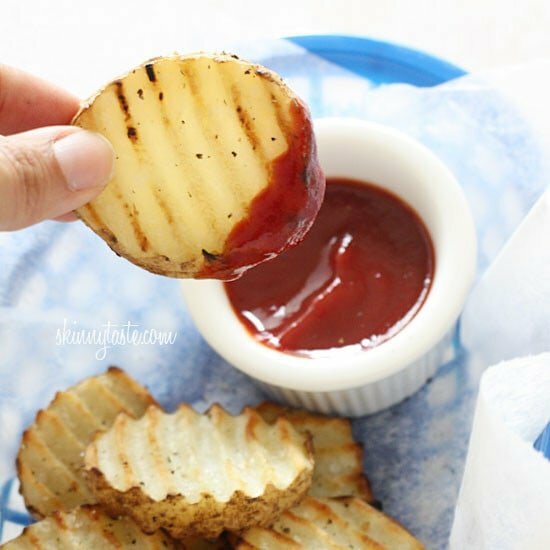 This is a great idea, ketchup is an ingredient I often overlook even though its so commonly used. This recipe makes my mind go back to my experience at the restaurant "Ketchup" in L.A. I ordered their fries (everyone had been raving about them) and the dish came with 5 different home-made ketchups- some more sweet, some salty…etc. My favorite was one that had cinnamon infusions! I guess the lesson here is that we shouldn't underestimate ketchup! 🙂 Thanks for sharing the recipe. Oh man, adding flavorings sounds AWESOME! having a toddler, I have never purchased so much ketchup as I do now. I JUST got home from grocery store and thought "I wish I knew how to make my own" while I was grabbing yet another bottle of ketchup there. Thank you so much!!! Amazing what you can get picky kids to eat when you give it to them with ketchup. Thanks for this recipe. I use ketchup as a binder when cooking ground meat. I can't use eggs due to my daughter's allergies. I could sure use the cost savings from the price of Heinz' organic ketchup, which is what I use. Thanks so much for recipe! My teenage, hockey player, son is trying to GAIN weight (I wish) and his trainer said to avoid ketchup in his diet because of all the sugar. This is perfect! Well it still has honey so you want to always have ketchup in moderation. Luckily a little goes a long way. And I'm turning to your site for yummy healthy foods to be a fit pregnant lady! I'm not sure, at least a week or two. In fact, the next time I make it, I plan to cook it about 15 minutes, then can it, seal it, and cook it in a water bath for another 10 minutes. It'll keep a lot longer this way, and you'll have ketchup for a year or more. This really is the perfect recipe, and is better than most ketchups out there. We will just never buy ketchup again. i wonder if you could add the honey at the end of the process because if you use raw honey heating it will kill all the good proteins in it. This is awesome! It is so hard to find non HFCS Ketchup! How long do you think this last in the refrigerator? Just remember, raw/unpasteurized honey poses a health risk for pregnancies, children 12 months & under and maybe be an issue others with compromised immune systems. I use raw honey too (preferred), just be aware of your target eater. A few hints to make this better? 1. Agave is pure sugar. Good honey is a much better choice. 2. Use 1/2 packet of Stevia instead of sugar. 3. Use kosher salt instead of table salt. This way you have a more diabetic friendly recipe with no preservatives except the white vinegar. Do you have a recipe for Chili Sauce like Heinz makes, to use in cocktail sauce for shrimp? Jennifer, raw honey is not unsafe for pregnant women. The pasteurization process of honey is no different, because the process is used to prevent crystallization, not kill bacteria. The adult digestive system will kill the bacteria in the honey before it reaches the fetus, and therefore is safe. It is dangerous for infants under age 1, because their digestive systems aren't acidic enough to kills the spores and it can cause botulism. Candice, I think it is a matter of why take the risk? In my nursing program we are taught that pregnant women should stay away from honey. Thank you for the info on the agave! I have been using it in place of honey. Didn't realize honey was better. Excited to try this! If agave is pure sugar, why is processed granular sugar any better? Just curious. Agave nectar making mostly fructose with glucose and it comes from a plant-making it a bit healthier. Table sugar also known as Sucrose is an crystallized Chemical/Compound with no nutritional value. The name Sugar is s description for sweeteners. Agave is a pure sugar but a natural sugar in stead of a chemicals- we all wish it still came from Sugar cane. Nonsense. The ONLY acceptable sweetener is a date. Sugar is sugar is sugar. ALL sugar is bad for you, excepting fructose when packaged with the fiber it came with (ie. 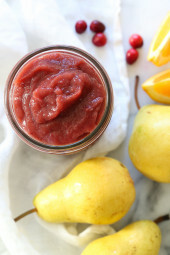 whole/pureed fruit) and even fruit shouldn't be consumed in large quantities. There are also concerns regarding hormone disruptions with agave, while all of the science isn't in yet, I'm not willing to risk it with my own children and husband. The fear for honey makes me laugh. Yet people are totally cool with vaccinating their barely 1 minute old. Smh. I think your recipe is completely great, no fear here. Xylitol would also be a good substitute for sugar or honey if you don't like the taste of stevia, like me. I will make with honey, and I would not ever be feeding a baby under 12 mos old ketchup anyway.. Seems like a bit of common sense.